Ok ya'll, I am super excited to share this guest post with you today. I have admired Brandie over at The Country Cook for quite some time now and I finally got to meet her in October. She knew exactly who I was when I walked in and greeted me with a big ole hug. That is my kind of southern hospitality. She really is the sweetest and I am honored to call her my friend. I sure wish we lived a little closer BUT she is just across the state. So on a whim I could totally get in my car and go for a drive and be at her doorstep in no time. Love you to pieces Brandie and I thank you so much for sharing this great recipe with my readers. I am so honored to be guest blogging over here on Served Up With Love for Melissa! I was so thankful to finally be able to meet Melissa at a recent Food Blogging Conference. Always nice to meet my fellow Virginia blogging gals! And Melissa is truly and absolutely one of the sweetest and most genuine women I have ever met! We are continuing to pray for her husband's continuing good health and recuperation as well as that of her Momma. So I thought I would share one of my favorite recipes are with y'all. And it's kinda perfect for this time of year. 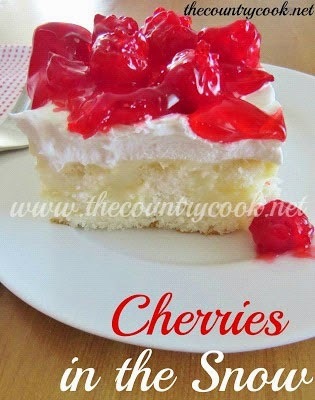 It's called Cherries in the Snow Cake. It could not be simpler to make! Plus, you can make it up the night before because it actually gets better as it sits overnight in the fridge! Prepare and bake cake according to package directions for a 9x13 baking dish. When cake is finished baking, while still warm, poke holes in cake using the end of a wooden spoon or something of a similar size. In a bowl, combine 2 cups of milk with dry instant pudding mix. Stir until smooth and let sit for just about 2 minutes. You want it just to begin to thicken (but still pourable). Pour pudding into the holes of the warm cake. Spread pudding around and gently press pudding into holes of the cake. Now pop the whole cake into the fridge for a couple of hours to finish cooling completely. Once cake is completely cooled, start spreading on whipped topping. Then dollop the cherry pie filling on top of cake. The pie filling won't cover every square inch of the cake. You want that white to peep through. Slice and serve. This cake must be kept refrigerated. Cook’s Notes: Cheesecake flavored pudding works really well with this cake as well. 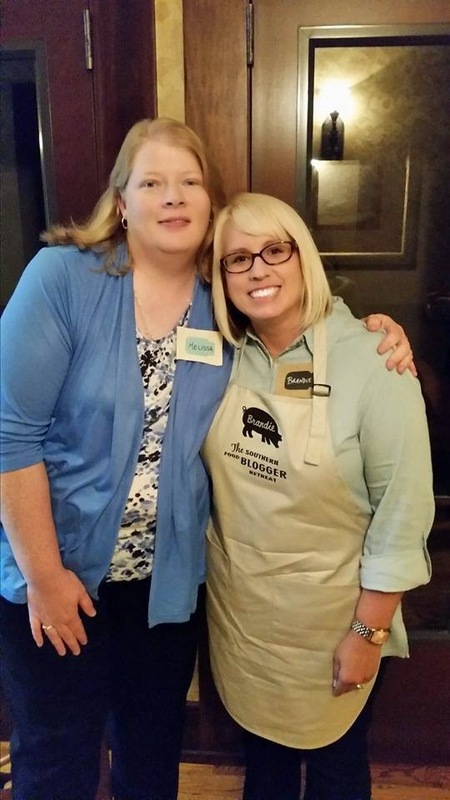 Me and Brandie at The Southern Food Bloggers Retreat in Alabama October 3-5, 2014. Love this recipe! For my variation of this recipe I change out the white cake mix for a chocolate fudge cake mix. My husband and mother-in-law both love it this way. That sounds great with chocolate. My family would love that too!